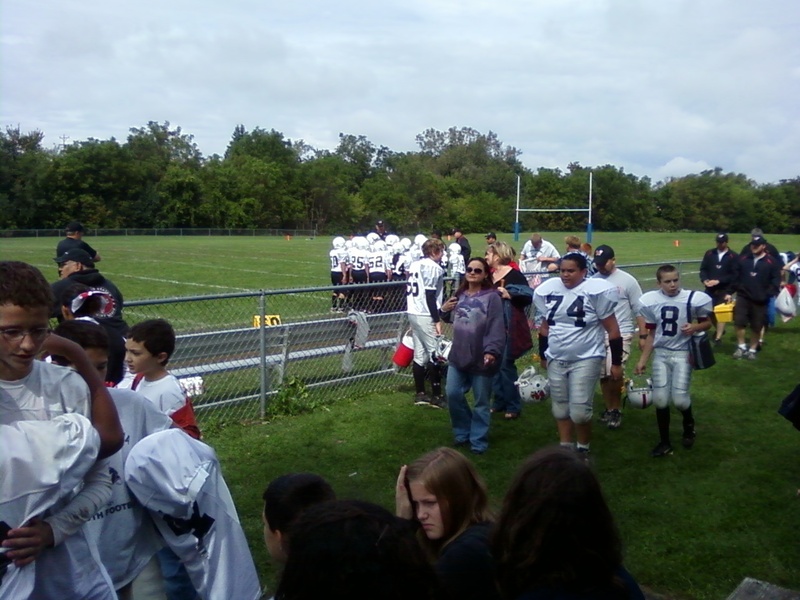 Spent the early afternoon at Ben's football game. It was a marquee matchup featureing the Waukesha South Jr Blackshirts vs. the Waukesha West Jr. Wolverines. This is a great rivalry for this area. At at the High School level it is a lopsided one, in favor of West. Evidently last year West beat South in the (then) 5th grade game "by cheating" in some form, according to Coach. So, he was out for revenge in a big way. He motivated his players by saying he wanted the 'shirts to "smash West in the mouth". My first reaction was that seemed a bit violent for the sixth grade level. Then I remembered that football is a violent game of brute strength. It is smash, or be smashed. Frankly I would prefer my son is on the smasher end, not the smashee. Turns out, it was good advice after all. So the Blackshirts got the opening Kickoff and went right down the field and scored. Then they kicked off and I got to see Ben "clean up" on the tackle. I count it as a 1/2 tackle, but hey, I'll take it. Ben seemed to enjoy this game more, mostly because he got some more playing time. It helps that every other series, South was kicking off, so he got on the field a lot that way. He also played some as receiver. 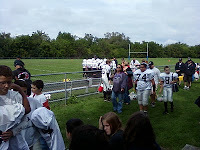 Sarah, Ben and I went to the South varsity game last night and saw them get whipped 42-26. It is good fun to go with the kids and pay $5 to yell at the refs. (Only kidding). It's cheap entertainment though. What I realized yesterday as I was watching a team that I have no special connection too, yet found myself screaming and cheering for, is that I just LOVE the game of football. I love the mechanics, the strategy and the battle of it all. It doesn't matter too much who's playing, I'll usually pick a team and pull for them based on my gut. Speaking of strategy, Milwaukee Pius who played South last night had a "trick play" where the lineman put their hands on their knees when the QB said "Down". Then when he said "Set", they all stood up and turned at the same time. This caused the defense to jump offsides. In the first series, they did it four times and South jumped offsides 3 out of the 4. All of this was after they started the game by trying an "onside kick" (unsuccessfully), another trick play. Then, they tried it another 4 or 5 times throughout the game, with diminishing success each time. Now here's my take on it. I'm not opposed to "trick plays". They add spice to the game. They can break a game open, and serve to keep the opponents on their toes. But when it becomes a major part of your team's game plan, I start to LOATHE them. Fool me once, shame on you. Fool me twice, shame on me. Start trying to fool me every 6th play and you need to grow a pair. Only sissies rely on repeated trickery. Play the game, you weasels. If you can't beat us using finesse and brute force, then take up chess or something. Argh it was annoying. Bunch of pansies. Sorry, did I say all of that out loud? There is nothing like a New Glarus (Octoberfest) Staghorn beer on a 64 degree fall early evening, with apple pie/applesauce aroma permeating the house. Every season has it's great qualities. The crisp fall air and the renewed energy it provides (after the stagnant heat of summer) is really a welcome change. Until about November that is when it gets not cool, but COLD. I got a nice note from Verse Wisconsin regarding one of my poems. They said they forwarded it and a few others on to Peninsula Pulse as an example of what is in VW, and so it may show up there too http://www.ppulse.com/ Not a big deal, but I'll keep my eye on that site nonetheless. Next week should be a bit crazy. Sarah has a game on Tues, Thurs, and then Sat. is a tournament. Saturday Ben also has a game and that night is our favorite holiday of the year "FallFest" up by Holy Hill. It should be jam packed fun all week. Hopefully I'll get a post in somewhere along the way and let you know how it's going.